All photographers have their own style and vision. Over the years my own particular focus has been landscapes and trying to capture how it feels to actually "be there." I'm also a designer by trade, so I've always wanted larger photos and higher resolutions. I shoot digital, so resolution is my constant nemesis. The larger the photo, the more you can do with it and the sharper it looks at reduced scale. With those goals in mind the leap to multi-shot composites was almost natural. For the longest time I worked with nothing more than a simple point-and-shoot camera (Canon SD800is). I loved that camera, but when shooting black and white it was pretty bad at capturing darker tones and contrast. In order to reproduce what I saw with my own eyes I got into the habit of tweaking contrasts and lighting in Photoshop as needed. Today I have a much better camera, but I still add a final layer of polish to each shot to tease out the full potential of the shot. I'll get more into that below, for now let's get this tutorial started with how to go about getting a handful of seperate shots to blend seamlessly into one. A word of warning: In order to focus on the core concepts of this tutorial I'm assuming a certain pre-knowledge about the workings of Photoshop on your part. If you're unfamiliar with layer transparency, free transforming, the Eraser tool, brushes, adjustment layers, layer masks or quickmasks it might be good to poke into those a bit first. I'm going to start with a confession: The main reason behind why I stitch my photos together by hand is pride. From what I hear, there's some slick plugins (or programs) out there now that'll aid this process immensely but, for myself... I like to be able to say that my photos are my own creations. I'm also a horrible perfectionist. So you've been warned -- there are potentially easier ways to do this. The idea behind doing multiple-shot composites is two-fold. First, you get a much wider (or taller) view of whatever it is you're capturing. This is similar in effect to what you'd see if you shot with an extremely wide-angle lens. The difference is that each of the shots that you're stitching together is the full resolution your camera is capable of taking. The first step is (naturally) to take the photos you'll be working with. I'm not going to go into the rudiments for photography here (I'm assuming you're on top of that yourself). I do however want to make two points that are particularly important to BW composites. When taking black and white photography on a digital camera, be sure to set your camera to black and white mode. Taking a color photo and desaturating it later is not the way to go (unless you're shooting RAW with no compression). The reason behind this is that digital cameras deliver JPG images. JPG images are unavoidably compressed, it's the simple nature of the format. Usually this isn't an issue since JPG compression is pretty good, but the catch is that JPGs compress to optimize for what you have, not what you hope to do later. This means that while you may have a JPG of a red flower and it looks great, removing the color will reveal all manner of artifacts that your eye couldn't detect—and they only get worse if you want to tweak contrast later. Basically, if you think you'll want a shot to be in color later, shoot it twice—kilobytes are cheap! Most of my composites are horizontal spreads, meaning I turn in a circle (looking slightly ridiculous) taking a series of images as I go. When taking your own set of images be sure to allow for 30-50% overlap between images. You'll need that space later, just trust me on this one. Below is the spread I'll be stitching together. Notice how much image content is duplicated amongst the separate photos... this makes life much easier down the road. As a side note, I almost always shoot my photo series by hand, not tripod. This is mostly due to the fact that I almost always forget to bring my tripod with me, but I rarely miss it. Whether or not you use a tripod yourself is up to you, doing so will probably result in a straighter spread (minimizing content lost to cropping) but a little practice without it can have you shooting freestyle with excellent results. Make a new document in Photoshop that's wide enough to accommodate all your separate images plus wiggle room. It's good to make it at least 1.5x the height of your images as well because you'll likely be distorting and rotating images as you stitch them. Pull all your separate photos into this document as layers and get them roughly laid out to confirm you've got enough room to work. Earlier I mentioned that multi-shot panoramic are basically the same idea as taking a single shot with a wide-angle lens. This concept comes back now as we think about where to begin. whenever you've got more than one image you're going to get some unavoidable distortion as you move across the images trying to line things up. My advice is to always start from the center, leaving the central image undistorted and stitching/distorting first to the left, then the right. This way you won't end up with a horribly lopsided image once you're all done. Sure, you could try and adjust that afterwards in Photoshop, but since most of these images get pretty large (my current record is 24,000px wide) I'd suggest you have a book handy while you wait for your computer to think that process through. Oh, and your computer will hate you! Let's start with the big picture: the idea behind stitching is to take two images and get one to flow seamlessly into the other. To do this we'll need to overlay one image over the other, line them up as best we can and then erase the edge bits that don't merge seamlessly. Conceptually that's a piece of cake. Actually doing it... well, here's how. For simplicity's sake, I'll be referencing the layout above (the "do it this way" one) in terms of which photo is which. First step for stitching "photo2" onto "photo1" is to make sure the layer of "photo2" is above "photo1's." Once that's accomplished, take a look at "photo1" and photo2 and select a prominent detail that is present on both. Ideally on "photo2" this detail should be somewhere near the right edge and vertical center of the image. To prevent needless frustration let me say this once and clearly: as we try to get the two photos aligned it is important to remember that we only care about lining up the seam between "photo1" and "photo2." There's really no way to get everything to line up on these due to camera distortion, so don't bother trying. We're looking for close enough, not perfect alignment... creative erasing will help seal the deal in the next step. Find a detail present in both photos that is close to the right edge and vertical center of "photo2." Make "photo2" about 50% opaque and overlay it on "photo1" so that the two details line up. Since most cameras have a slight lens distortion of some sort, you'll likely see a fun circular pattern as things get more and more unaligned. Lens distortion on the camera can produce some trippy effects when you're overlaying images. Odds are also good that the two photos are rotationally off to some degree. To counter this (and not lose your alignment point) hit Command + T (or Edit > Free Transform) for your "photo2" layer. Drag the transform centerpoint so it's over your alignment point. This will allow you to rotate "photo2" as needed without losing your place. As you rotate "photo2," you'll notice that things go in and out of focus. It's possible you'll also need to play with distorting the image as well to get things to line up right... you can do this by holding down shift as you drag the corners. Keep in mind that it doesn't have to be perfect, just close. Distort and rotate the image to get the right edge as closely aligned as possible. It doesn't have to be perfect, just close. When you've arrived at a decent place, apply the transformations and bring your layer back up to 100% Opacity. The last step is to erase the edge on "photo2" (shown below). You want to basically erase just enough to kill the edge and hide your seam, but not enough to reveal how the images don't line up entirely... as such it can be a bit of an art-form. This is usually the point where I curse my foolish pride, but it can be done—and the results are usually good enough that nobody can tell where you joined the two images. Your mission: kill the edge. Another important thing to keep in mind as we begin erasing is that the human eye is really good at picking out lines. We can do it even when the lines aren't there. The trick to avoid an obvious (or even hinted-at) erase line where the two images join is to erase in an erratic pattern wherever possible. I'm usually using a tablet as I do this, and prefer a medium-sized fuzzy brush since I've got pressure variance to help me out. If you're using a mouse you'll probably do fine with a fuzzy brush, but smaller could be better. To help me find the edge I usually keep my fingers on Command + I in order to invert "photo2" as needed and see where I'm at. Above is an example of what you want to watch for as you go up the line. There's nothing worse than finding one of these missed edge spots after you've finished the entire image—take care of them now. Also make sure that as you erase you're not revealing any points that don't align. These areas will usually pop up more frequently the farther away from the seam you go, but you may have to erase around trouble areas closer in as well. Like I said, it can be an art form at times. Pay special attention to natural lines where special attention may need to be paid. These include walls, tree branches, rock lines, and horizons. Repeat this process for the other photos. Stitching is a tricky endeavor, and I totally understand if you disagree with me on whether or not it's worth the pain... it might be worth it for the bragging rights alone ;). While there are a lot of creative things you could do with a composite panoramic. I tend to crop mine to a rectangle and go from there. You may find that the final composite needs a little rotating (depending on how steady you were when you took your image sequence) before you crop. As a side note, if you've opened the PSD file for compositing, you'll notice that I ended up only needing four of the five original images in my spread. That's a good position to be in... you'd much rather have extra overlapping imagery than a gap. I just threw out a lot of Photoshop terminology for one little sentence, so let me go through it piece by piece. The idea behind quickmasks is that you can use the value range between black and white to control the opacity of a mask. In this manner you can draw a mask for whatever you need. The tool yields incredible control and can be put to use in a wide variety of ways. Quickmask mode (where you create your mask) is entered (and exited) by clicking the button highlighted on the toolbar below. Using quickmasks you could—for example—enter quickmask mode, write your name in a black brush (it'll show up as red), and exit quickmask mode. You would then have a marquee in the shape of your name. To be specific, you should have a mask in the shape of the area AROUND your name... this is a good time to get comfortable with the keyboard shortcut of Command + Shift +I to invert masks. If you used a fuzzy brush, your name mask will be correspondingly fuzzy around the edges. If you're still puzzled by quickmasks I would encourage you to play around with them to help wrap your mind around what they do. I have noticed when explaining them to others that quickmasks are a get it immediately or don't sort of feature, but everyone comes around in the end. This is the quickmask toggle/button. Layer masks are a tool that allows you to non-destructively hide or show parts of a layer without permanently erasing. If you click on a layer and then click the button highlighted in the image below, you'll notice a white box appear on the layer menu. This is an attached layer mask. Layer masks function exactly the same as quickmasks do, mainly your whites are show the layer, and the blacks are hide the layer. Again, playing with this is a far better teacher of how the layer mask works than me telling you—experiment with this so you're comfortable. The little chain icon indicates that the mask is bound to your layer, meaning as you move your layer within your document the mask elements will move as well. Clicking the lock will unbind the layer mask, leaving it stationary as you move the layer elements. There's a time and a use for both modes. This is the layer mask button and a layer mask applied to a layer. Adjustment layers are basically layers that control editable filters such as curves, hue-saturation and levels. These are among the most useful tools you could ever ask for to perfectly tweak your photo... since discovering them I rarely apply straight adjustment filters to my imagery anymore. Why would you when an adjustment layer would do just as well and remain fully editable? Even more importantly they come with layer masks pre-applied so you can edit not only the settings of the adjustment filter, but also the manner of its application. I love these things. To add an adjustment layer, simply click the icon I've shown highlighted below and choose which type of layer you need. You'll notice it comes with a layer mask already applied. This is the adjustment layer button and options menu. Alright, let's get back to work. Flatten your composite and use guides to mark out the minimums in terms of width and height, making sure to crop out any residual edges along the top and bottom of the composite image. Create a rectangle marquee inside the guides (the marquee should snap to them) and crop to that selection. Crop to the minimums in terms of width and height. Cropping should leave you with a nice rectangular image that is primed and ready to go for photographic tweaks. Depending on your particular photographic style you'll naturally vary the amount of contrast and tweaking you do from what I show you here. In general I try to capture the full range of value in my black and white images, from pure black to brilliant white. The trick is, you don't want to just apply levels across the entire image... that usually results in areas that are either too dark or blown out. To avoid this, we'll leverage the natural values of the image in a Quickmask and apply it to whatever adjustment layers we need. Select the whole image (Command + A) and copy it (Command + C). Then, with your entire image in the clipboard, toggle into Quickmask mode and paste (Command + V). This might take a moment if your image is huge but eventually you should see the whole image turn varying shades of red, as shown below. Toggle out of quickmask and you should see your image going slightly nuts with the animated dots of selection marquees. Go over to the layers palette and create a levels adjustment layer. You'll notice that the layer mask attached to the adjustment layer automatically used your whole-image mask to create varying darks and lights. You've just created an adjustment layer that will adjust the values of your photo more or less depending on how dark or light the image itself is. To create other adjustment layers with the same layer mask, just Command-click on the first layer mask to reselect it's transparency and create a new adjustment layer with that selection. This is the raw technique for making adjustments to your image. If you open up the "part 2" PSD file, you'll see that I combined the selection method we just went through with more selective hand-drawn layer masks for the Major Adjustments layer set. You'll likely end up doing the same, using brushwork to add more adjustment to parts and less to others. The important thing is now you know how to get that major first step... everything else from there is just details and your personal taste. On an organizational note, I usually keep the original composite photo (pre-adjustment) separated out and do all my work inside layer sets... this allows me to flatten the whole batch of adjustments easily and move on to the next step. Take a look at the "part 2" PSD and you'll see what I mean. Stepping ever further into personal style, the next thing I do after getting my composite photo nicely cleaned up and contrasty is make sure that the light (usually my main character) is well-represented. Light is the end-all element in a photo for me, the major player in how the eye is directed about the scene. Light can make or break a composition depending entirely on how it is captured. As such I like to give my photos a little extra love to help them communicate to the viewer how the light is playing about the scene. Where is the main light coming from? Where is it landing as a primary light source? Where is it landing as an secondary (ambient) light source? The image below has some of the answers I came up with. With this in mind I try to make whatever the light is doing a little more apparent. Ambient items should glow a bit more, and their shadows should become a bit more pronounced to let the light show better. Items in full sunlight should get a subtler treatment so they don't get blown out. If the light is especially strong (such as along the top of the photo) I might take some creative license and add a slight diffuse glow to help communicate its brilliance. 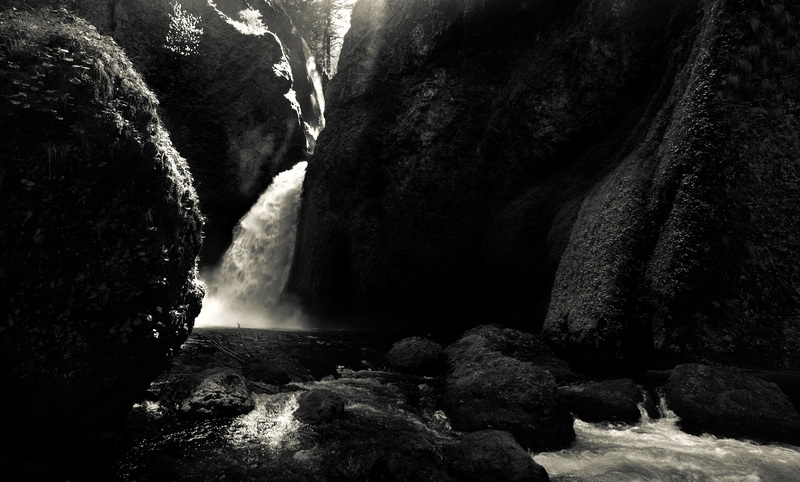 Finally, I also add light back in to bring details out, like the swirl of the water and the texture of the waterfall. Below is the final enhanced image. Enhancements by their very definition should be subtle—you'll be able to see what I did better by comparing the "Major Adjustments" and "Light Enhancement" layer sets in the PSD file. The final step for my black and white photos is to add just a touch of color. It constantly amazes me how even the tiniest hints of color can bring a scene to life. In my snowy landscapes I'm likely to add a cooler note to the black and white, appropriate to the snow and austere character they often have. For this image I'm thinking a warmer note will do. To add color, we'll go back to our favorite trick of adjustment layers with quickmask-produced layer masks... The reasoning behind this is that the warmer colors we'll be adding should come from the light, and an even subtler range of cool colors should belong to the shadows. After flattening the "Light Enhancement" layer set, copy and paste that new layer into a quickmask (so we get a mask with the latest value changes included). From there make a Color Balance adjustment layer and a Hue/Saturation adjustment layer with the photo selection. We'll start with opening up the the Hue/Saturation adjustment layer first... in most cases, hue and saturation in a black and white image is somewhat pointless. But look closer at the H/S palette and you'll notice a checkbox labeled Colorize. Check it. Now we're adding color to the image, and the sliders shift to indicate which color (top) and how much (middle). Adjusting the top to 45 and the middle to 25 gives us a subtle mellow yellow tint to our image. Keep in mind that our goal isn't to blast the photo with color, just add hints to tip the viewer's perception one way or the other towards a warmer or cooler image. Since Color Balance has a tendency to affect the light/dark values of a photo I tend to use it sparingly, often for the most subtle of effects. Again, looking at the PSD file, you'll notice that I've used the same layer mask on a cool and warm Color Balance adjustment layer. You'll also notice that the warm Color Balance layer is so subtle it's almost impossible to see what it does. It's main purpose is to inject the final tiny amount of warmth into the highlights of the image. Its counterpart (the cool Color Balance) is there to add a cooler tint to the shadows of the piece, providing contrast to the warmer colors and helping the colors of the scene show more depth than a simple watered-down sepia effect. Once the Hue/Saturation and Color Balance are tweaked to taste... you're done. Congratulations! While you've probably heard the practice makes perfect argument already, allow me to bore you to tears by bringing it up again. A lot of what we just went through was developed via extensive experimentation and practice...Stitching photos together by hand is a tricky endeavor at best. It could almost be likened to an obscure hobby, like screen-printing t-shirts despite the invention of the printable iron-on transfer. And while going the harder route is not for everyone, for those that try there is an undeniable element of personal craft and skill that makes it all worth it. Advanced image adjustment, however, is something everyone should know—if only to ensure the photos you take live up to their true potential. If this tutorial was your first exposure to quickmask, layer masks and adjustment layers let it not be your last. They are all incredible tools for non-destructive digital enhancement. For all digital photographers, Photoshop is your digital darkroom: the better you know your way around, the better your results will be. I certainly hope this was a useful read for all of you who made it this far. Feel free to drop by my gallery of works at artofgregmartin.com to see how the methods I've shared here have manifested in my other panoramic compositions. Many thanks to PSDTUTS for giving me the opportunity to share my collection of tips, tricks and eccentricities through this tutorial. I'm an interaction designer at Ziba Design as well as a freelance illustrator/photographer. Feel free to drop by my gallery of works at artofgregmartin.com as well.